I've said it before, I miss Chinese food. All the soy sauce and wheat-y noodles and sauces make it a no-go area for most Coeliacs, especially since the risk of cross contamination in restaurant kitchens is pretty high. So, I tend to opt for making my own. Here are my favourite recipes to hopefully inspire you. Pot stickers (and steamed dumplings): It's easier than you think to make dumpling wrappers and, once you've got the knack the world is your oyster! You can use the same recipe to make wontons, pot stickers, spring rolls and even pancakes to go with duck! Pak Choi-Wrapped Fish: Grace at Gluten Dairy Free shares this beautifully versatile recipe that has all the flavour you'd expect from Chinese food. It's a light and fresh dish that you'll make again and again. Fortune Cookies: I've mentioned this recipe before and I'll probably do it again because I love it so much! Saara at The Gluten Free Student Cookbook came up with a recipe for gluten free fortune cookies, perfect for when you have friends over for a Chinese feast. 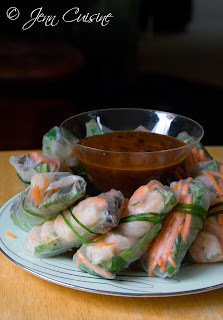 Spring Rolls: Jenn at Jenn Cuisine uses rice paper wrappers to make her spring rolls and the result is both stunning to look at and fantastic to eat. You'll find rice paper wrappers in some suoermarkets (I've bought them in Morrison's) and Chinese supermarkets. Tempura Prawns: Technically this is Japanese, but the this batter recipe would be equally as good as banana or pineapple fritters. To make the caramel sauce just put 1 cup of caster sugar, 1/4 cup of water and 2 tbsp sesame seeds in a saucepan and bring to the boil without stirring. Leave to simmer until you have lightly golden syrup and dip your cooked fritters in just before serving. Hot and Sour Soup: Super quick and easy to make, it's satisfying and delicious and a bit of a staple in my house. If you don't have a Chinese supermarket near you (I don't, and there's only so much I can transport back from Glasgow when I visit my parents!) then Asian Cookshop is a fabulous resource and they'll deliver orders over £24.99 for free. So, what are your favourite Chinese food recipes? I'd love to know! I love Chinese food. I'm excited to be able to try it GF. I am starting a weekly Gluten-Free Share Page on OneCreativeMommy.com. It's brand new, but I hope it will become a great resource as it grows. I would love it if you added my party to your list of places to link up and shared some of your great ideas each week. I hope to see you there.